The ETK-M/ETW-M surface-mounted water meter is a single-jet dry-running meter with option counter and impulse module. 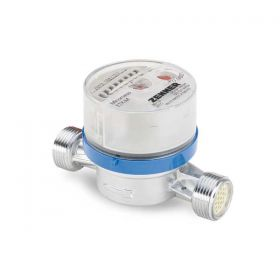 Highest precision, modular retrofitting option with electronic modules and automatic barcode recording option are the performance characteristics of the ZENNER ETK-M/ETW-M water meter. The 8-digit counter allows litre-perfect reading results. We provide suitable models for typical consumption and usage in the residential or flat sector, with nominal flows of Qn 1.5 m³/h and Qn 2.5 m³/h or Q3 = 1.6 and Q3 = 2.5. With installed face-to-face lengths of 80 and 110 mm for ¾ inch thread and 130 mm for 1 inch thread, these will overcome almost every installation situation, hands down. The rotary meter head enables trouble-free reading in any installation position. The water meter can be superbly installed in dwellings or flats, both for the initial installation and for exchange installation. Nominal Diameter (inch) 3/4 "